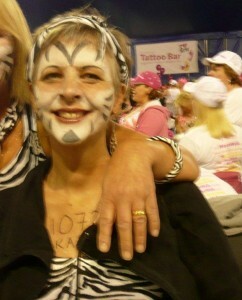 Last January I decided to train a group of women for the London Moonwalk a 26.2 mile walk in aid of breast cancer. A fun group of 10 ladies joined my team and one of those was Karen Hughes. Karen told me that she was in recovery from recent breast cancer ops and had a desire to join the group but felt apprehensive about her capabilities, as the cancer and treatment had left some breathing difficulties and a low immune system. During the first couple of weeks Karen suffered brief anxiety attacks which made her breathless, this I explained was due to her own self confidence and I believed it was a challenge that was certainly achievable and with Doctor’s permission would be good for her. So after initial wobble Karen set to the training program in hand and again I stressed that the ‘homework’ Midweek training, a little strength and flexibility exercises, correct eating and good hydration was all a very important part of the challenge. Karen totally took on board all the advice and I and the other members of the team were amazed at the changes each week with Karen. She started to bounce into the Sunday training earlier than the others, always did training even when on holiday. Karen started to shine in confidence and became inspirational to all the team, which was a great help as we each had a difficult week of our own throughout the 17 week training. On the day of the Moonwalk, Karen was nervous but as soon as the power walk started her focus began and she contributed massively with words of motivation to the success of the whole team on the day. It was a fab experience for all the team and some great friendships were made.